'Co-everything' brings the rise of the IoT partner ecosystem - IoT predictions 2018: What will the next year of connectedness bring? IoT is all about connectivity -- connecting devices, connecting people, connecting systems. And when it comes to connecting everything, that means connecting providers and partners too. Maciej Kranz, vice president of strategic innovation at Cisco, discusses the importance of building an IoT partner ecosystem and explains why teamwork and collaboration are key to the success and fruitfulness of an IoT project. "In 2018, we will see the rise of co-everything. The internet of things will continue to drive the 'co-economy' -- or what I like to call, 'co-everything' -- model in 2018, with companies large and small co-innovating, co-developing and collaborating. Through this new ecosystem of partners -- horizontal, vertical and geographic alike -- all players combine their expertise and resources for IoT projects. The result is a comprehensive, effective IoT solution that meets the end users' very specific needs. 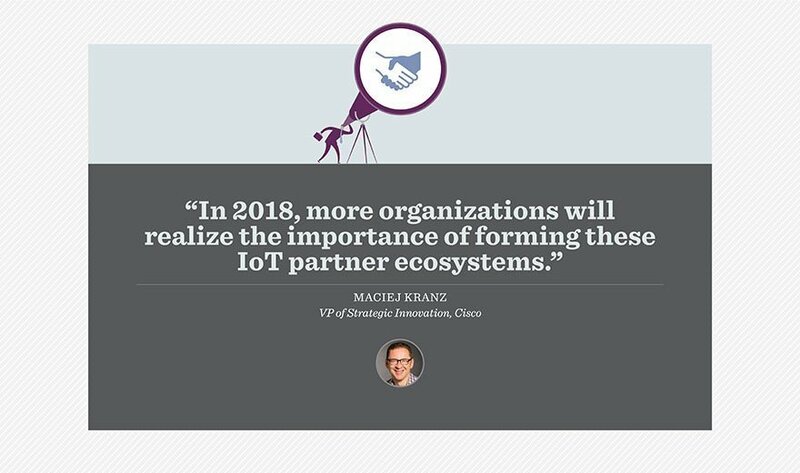 In 2018, more organizations will realize the importance of forming these IoT partner ecosystems and begin to understand that the internet of things is not something you can approach alone. "An example of a successful project comprising a collaborative IoT partner ecosystem involved tech companies Cisco, Bronze Software Labs, Leonardo S.p.A. and several other stakeholders that worked together to create an IoT disaster management solution in Glasgow that none of the companies could have delivered on their own. Cisco, a horizontal technology provider, brought the expertise in IT infrastructure, collaboration and security, as well as IT industry knowledge. Bronze Labs, also a horizontal expert, provided IoT software, and Leonardo, a vertical provider, offered high-tech aerospace and defense expertise. Organizations including Scottish Water and Glasgow City Council, both geographic players, also worked on the project to ensure a hyperlocal deployment. The result was an IoT solution, Conserve, that collects and visualizes data from assets such as fire engines and ambulances, as well as volunteer networks, to predict and help coordinate first responders during disaster situations." Has an IoT partner ecosystem worked for your organization?